During the last week the Conference Board also reported positive increases in the October LEIs for the U.K, Korea and China, and a decrease for Spain. The U.S. economy is showing some sparks of life in late 2010. Overall, the indicators point to a mild pickup after a slow winter. Looking further out, possible clouds on the medium term horizon include weaknesses in housing and employment. Not exactly a hugely positive statement. We would expect this when the Fed is injecting massive amounts of money in the system but cannot figure out how any gains would be sustainable when the inevitable reduction in liquidity has to take place and when debts have to be repaid. According to the FOMC the pace of the recovery has changed from "slow" to "insufficent". I think the term "gaining momentum" is the better choice. Every day as I go to work I see more and more truckloads of trusses and housing panels being shipped. More roofing trucks, and more dump trucks. More trucks with help wanted signs. You guys need fewer statistics (always flawed unless you agree with them) and a little more observation. The stock market and Wall Street bonuses are up nicely. Wall Street has recovered well thinks to big bailouts and profit from goods produced in foreign lands. Much happy talk to the contrary the number of people working declined from October to November and the number of people unemployed went up. Despite good leading indicators, which appear never to have declined below their 2004 level, Main Street has seen no recovery in any meaningful way. The best that can be said is that the Main Street decline has slowed. 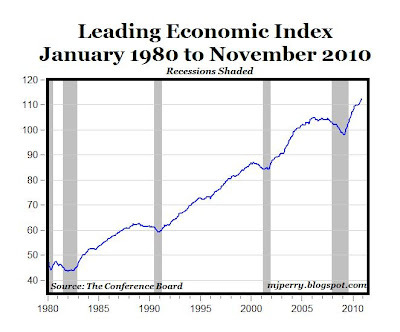 With respect to The Conference Board Leading Economic Index could it be that three of the ten components, stock prices, money supply, and interest rate spread, are up not because the economy is doing well but that they are driven up by QE2? The latest round of government stimulus (QEII and fiscal expansion) will have a more powerful effect on economic growth, because of stronger household balance sheets and reduced hostility by government towards business. However, to accelerate the expansion, and prevent a double-dip in a couple of years, government spending, regulation, and taxes will all need to be reduced. "Households are reducing their debts and building savings faster than he anticipated, said Richard Berner, co-head of global economics for Morgan Stanley in New York, giving them more room to spend in the future. The Commerce Department reported on July 30 that the savings rate was 5.9 percent in 2009, up from a previous report of 4.2 percent. The rate has averaged 5.8 percent through the first seven months of this year. The bond market won’t fare as well, according to Berner. He sees the yield on the Treasury’s 10-year note rising to 4 percent or more by late 2011 as household spending and the economy strengthen. The yield stood at 2.79 percent on Sept. 10 in New York." Any objective look at the debt load and the demographic profile of the country would have to conclude that 5.9% is not good enough. You have people who are nearing retirement owing more on their homes than those homes are worth at a time when employment issues are going to be a headwind for most of the population. The Fed is busy trying to bail them out by destroying the currency but its efforts will be offset by the bond markets as lenders demand much higher interest rates to continue extending credit to people who are drowning in it. The consumer has already done a lot of the heavy lifting. What does this mean? Consumption is not difficult. This type of comment shows that the author is a Keynesian and that any rational individual should ignore him. VangelV, U.S. households have been paying-down or defaulting on debt to increase their monthly incomes. So, they can spend more, which will drive economic growth. Also, their balance sheets have improved from a rising stock market, and I suspect, housing prices will soon increase. During the bubble years, demand for houses, autos, imports, etc. were high, because of bargains (low prices and interest rates). It was perfectly rational to spend rather than save. However, slowing demand was inevitable, because of diminished marginal utility. Also, U.S. households didn't squander their money like the government, and they're saving with little or no real government help. Moreover, high debt levels will force Americans to work longer, which will add to future economic growth. However, currently, household debt, or the cost to service that debt, is not high, particularly compared to the real value of assets. More proof that Obama's economic policies are saving us from the Bush disaster. Obama is saving our economy !!!! Maybe Don can save us from Obama's policies by inventing a valuable good, hire a thousand people to mass produce it, sell it at a low price, make billions of dollars in profits, and pay billions of dollars in taxes to shrink the budget deficit. Furthermore, I may add, too few dollars in the U.S. private sector caused the recession and contributed to the slow recovery. Higher wages or lower taxes would've continued the "Goldilocks" economy, and any "excess" assets and goods would've been consumed instead of destroyed. 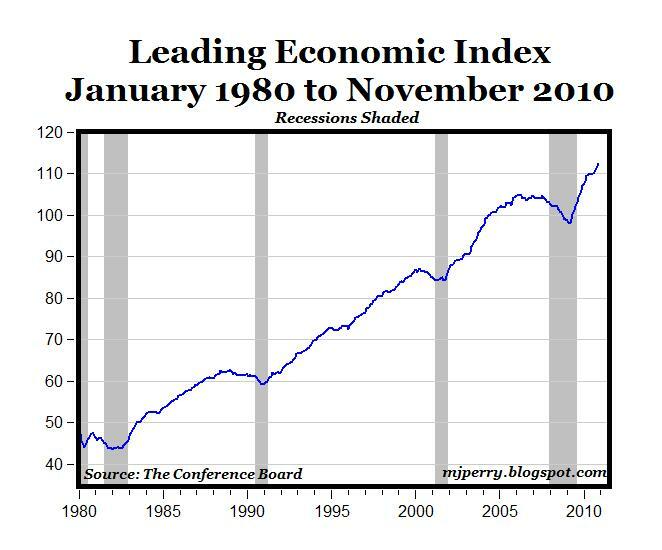 The result of too few dollars has been persistent below trend GDP growth that fell from optimal growth rather than from above trend growth. I wonder how much money my buddies in government spent in the Iraq war. How many trillions did we waste and are we still wasting in Iraq. By buddies have yet to answer me !!! Don, the U.S. spends a lot of money on the military, whether or not we kill people. "Since the peak of home values in June 2006, more than $9 trillion in values has come out of the housing market. As a comparison, that’s more than the cost of 12 wars in Iraq, according to a study by the Congressional Research Service. U.S. homes are set to lose $1.7 trillion in values during 2010. That’s 63% more than the $1 trillion lost in 2009." Actually, economic growth requires capital investment, and that comes out of savings. Consuming capital, as is being done now, is never a good idea. House prices are down significantly and most people who purchased a home over the past five years have no equity. Delinquent mortgages stand around 10% and there is a massive shadow inventory that will prevent real prices from increasing. Any improvement will come from the liability side as the Fed does all that it can to devalue the dollar as quickly as it can. The average American is in big trouble and is far from secure. He should not be spending money on depreciating goods but should pay down debt and invest in productive capital. Actually, during the bubble the most rational action would have been to be on the decline on the purchasing power of the USD, not to spend more than you should to buy things that you could not really afford. For many of us Clinton, Bush, Greenspan and Bernanke were our greatest benefactors because they gave us a once in a century opportunity to make massive gains in real wealth without taking huge risks. The last time we had this type of an opportunity was from 1927 to 1940, a period that created huge fortunes for many of today's richest American families. Let me see. They bought houses that carry mortgages that are 10-50% higher than the market price and you don't consider that a waste. In what world would that be true? But they just saw their unemployment insurance extended by more than a year and have seen the passage of legislation that allows them to stay in their homes without making payments to the mortgage holders. Why would they have to work when the government is handing them free money and they don't have to pay off their largest debts? The US private sector got plenty of dollars. Unfortunately, the dollars went into terrible investments like building new lines at GM and houses in far off suburbs. But there never was a "Goldilocks" economy. A bubble is a bubble is a bubble. As I have written before, the problem was created by artificially low interest rates that encouraged malinvestments. Yes it does. You need to cut it down by 75% or so and stop wasting money defending Germany, Korea, Japan, etc., and having a military presence in more than 100 countries. Since the peak of home values in June 2006, more than $9 trillion in values has come out of the housing market. As a comparison, that’s more than the cost of 12 wars in Iraq, according to a study by the Congressional Research Service. The homes are still there and still just as useful as before. What has changed is the market price, which is not surprising given the fact that value is subjective and subject to a number of factors that drive individual preferences. Members of Congress overwhelmingly voted to give Bush the authority to invade and occupy Iraq even though they knew that there were no WMDs and that Iraq had nothing to do with 9/11. Obama is doing the same thing as Bush did and continues to waste lives and money on a lost cause that will weaken the economy and destroy the country. He seems to be even stupider than Bush was and has shown that his promise of change was an empty one. "I wonder how much money my buddies in government spent in the Iraq war. How many trillions did we waste and are we still wasting in Iraq. Well gee! What did Congress and the administration know in 1998 that they didn't know in 2001? VangelV, if everyone buried or hid their money, or everyone bought too many socks and you're selling socks, good luck trying to sell your goods. Of course, a new invention or new market may bring demand. Idle resources is a true waste. The country is better off building "too many" houses. However, it would've been even better if the excess capital was directed towards higher wages or lower taxes rather than channeled into the housing market. I don't believe too much capital, causing interest rates to fall, is a bad thing, even if it "encouraged malinvestments." The U.S. economy became much more efficient after the Creative-Destruction process, in the early 2000s. So, U.S. corporations were able to produce more output with fewer inputs, achieve a record 20 consecutive quarters of double-digit earnings growth, and had huge capital account surpluses (which offset huge current account deficits) from international trade. The "excess" capital had to go somewhere. The best place for it to go is optimal growth to raise living standards at the fastest sustainable rate. Hid their money? They are drowning in debt and have no money to hide. That is why they need to stop buying crap they don't need on credit and start to save more. That will always happen when the time is right. But top down planning or money printing can never create a new market that is sustainable. Why would anyone waste capital by directing it towards higher wages if high wages are not justified? I agree about the need for much lower taxes but those are not in the cards given the sentiment among the political elite, the media, and unsophisticated voters who actually see government bureaucrats as anything other than a group of thugs using extortion to rob the productive class. You need to educate yourself. Money coming out of a printing press or credit being created out of thin air is not capital. The U.S. economy became much more efficient after the Creative-Destruction process, in the early 2000s. It did not. Growth was very low and debt was growing much faster than GDP. So, U.S. corporations were able to produce more output with fewer inputs, achieve a record 20 consecutive quarters of double-digit earnings growth, and had huge capital account surpluses (which offset huge current account deficits) from international trade. There was no 'excess capital.' There was too much money printing and too much easy credit. The effect was a diversion of scarce resources into speculative sectors and the creation of bubbles that had to burst. VangelV, there is no way to put your comments into any credible economic model I know about. Workers are less likely to spend more when there's greater uncertainty. When people can afford their monthly payments, they're not "drowning in debt." Consumers don't buy "crap." A 10% unemployment rate is an example of idle resources. Bargains are not a "true waste." A "malinvestment" may not only be a buyer who bought too high, but also a seller who sold too high. Investing in the labor market may not be a waste, like investing in capital markets may not be a waste. Printing too much money causes inflation. Efficiencies in production, including earning more profit, causes deflation. Assets grew much faster than debt. The production and prices of goods and services is not the same as rising or falling asset prices. In the U.S. over a five-year period during the 2000s two million houses a year were built, 16 million autos per year were sold, U.S. real GDP expanded 3% annually, in spite of 6% annual current account deficits (which subtract from GDP). The U.S. was the main engine of economic growth pulling the rest of the world's economies. Workers are less likely to spend more when there's greater uncertainty. When people can afford their monthly payments, they're not "drowning in debt." But that is the point. They can't afford monthly payments. If they could, the foreclosure rates would not be as high and they would not be behind on their payments. A 10% unemployment rate is an example of idle resources. I agree. That is why Congress should stop subsidizing unemployment. If it did we would see less of it. Bargains are not a "true waste." A "malinvestment" may not only be a buyer who bought too high, but also a seller who sold too high. You are confused. First, the key to doing as well as possible is to sell as high as possible. Second, I do not think that you understand what a malinvestment is. Investing in the labor market may not be a waste, like investing in capital markets may not be a waste. It is easy to tell if an investment is a waste or not. The market tells you by giving you a profit or a loss. Printing too much money causes inflation. Efficiencies in production, including earning more profit, causes deflation. Productivity is good because you get more stuff for less money. We are all better off. Money printing is bad because you just get higher prices. Assets grew much faster than debt. No, they did not. Debt was growing much faster than capital. Nonsense. The US has changed the way it calculates inflation so its 'real growth' has been overestimated. And much of what you took as real growth was created by accounting games that had nothing to do with the real world. It is easy to build lots of things when they are paid for by printing new money or borrowing from foreigners. That is what the US did. Now that it is insolvent the future is not nearly as great as it is being portrayed by many on this site. No, it wasn't. Europe did fine but neither the US nor Europe did nearly as well as China or the developing countries.